NEW Purex PowerShot Detergent simplifies the laundry routine by taking the guesswork out of measuring. Purex PowerShot is the only bottle that automatically dispenses the right amount of super concentrated formula with 50% more stain fighting power in every drop. Purex PowerShot is easy is use. Just open the cap, flip the bottle upside down to deliver one super concentrated does of detergent. Flip the bottle back upright, and you are done! The PowerShot engine automatically refills and is ready for the next dose! 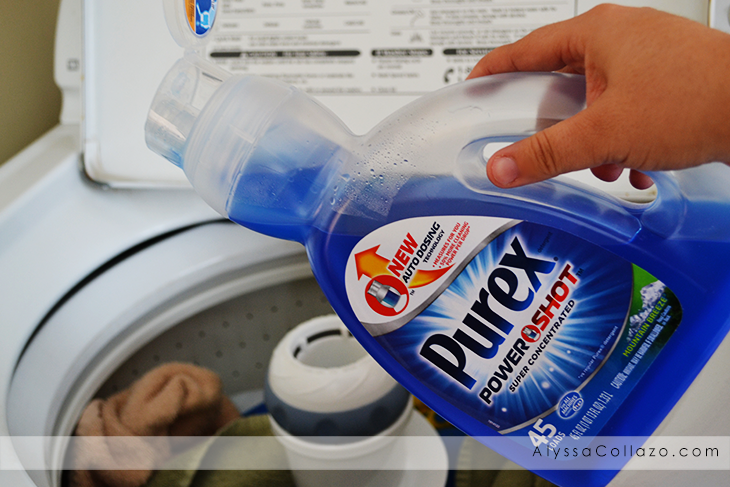 There is so much to love about the new Purex PowerShot. I especially love that this new detergent measures for you. I know that some of you don't really care about measuring precisley, so this completely takes the guess work out, and you don't overdose your clothing. It dispenses just the right amount. And did I mention that this smells totally amazing? Purex has hit the JACKPOT with this new PowerShot detergent. Here's how it works. 1. Open the cap. 2. Flip the bottle upside-down. 3. Pour the liquid into your washing machine. That's it. Seriously. And when you set it upright again, it automatically refills and readies for the next dose! The cap is a flip-top, and the only detergent that you are exposed to is the part that is in the ready dispenser. You can use 1 flip for regular loads, or 2 flips for large or extra dirty loads. You are going to love Purex PowerShot! But wait, there's more! (2) of you are going to win coupons for a FREE bottle of Purex PowerShot detergent! This giveaway is open to residents of the US only. Ends 2.9.15. 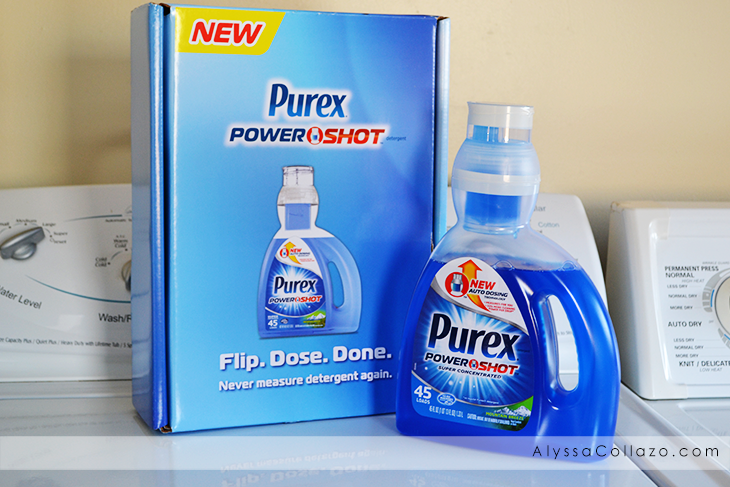 To celebrate the release of the NEW Purex PowerShot detergent, Purex will be hosting an amazing giveaway! Enter the sweepstakes & sign-up to receive a $1 off coupon HERE. Three grand prize winners will receive a Whirlpool Washer & Dryer set. 300 second-place winners will receive a bottle of PowerShot. To enter this promotion, simply visit their site and fill out the entry form. You can enter until March 31, 2015. Good Luck! DISCLAIMER: The Purex brand provided me with a sample of Purex PowerShot Detergent in exchange for a product review. All opinions stated are my own and are not influenced by any affiliates. I have been meaning to try Purex forever. I have heard such awesome things. What a great giveaway! This look so simple to use. I love the Liliies detergent. The scent is so awesome. I just recently tried Purex, and I love it. It works great, and it doesn't cost very much. This is a great giveaway! I've never used this product but maybe I'll give it a try! I love Purex, therefore I love this giveaway. That stuff cleans like nobody's business! Purex is a great product! I love the giveaway too! There are a few laundry detergents that I'm allergic to and purex isn't one of them! I love it! That is brilliant! Never tried Purex, I may have to give that a try. This is something for us to try.. who knows maybe it works better then whatever we currently use! I really like that it measures itself. The caps always get messy when you pour it yourself. I'll have to check this out for myself! I love Purex it's one of our favourite brands to use! I haven't tried this though, I will have to check it out! I haven't used Purex in years. Now that they have come out with the marvelous invention so I no longer have to spill it all over-(just call me a klutz)-I am going to get it once again. I love this stuff! I have a bottle of this too and it works out great. It's so easy to pour and it doesn't make a mess! Their Laundry detergent... I have quite a few bottles at all times in my closet! I am a fan of Purex already. Now I am teaching my teen aged sons to do laundry and I love this idea! It will save me so much wasted soap. Dirt Lift Action Purex is the one I use. What a great giveaway - your detergents in the USA are much better than our UK ones! Purex fans here! Can't wait to try this! This looks like great stuff. I'll need to give it a try. I am loving how it measures the liquid! I’ve been using Purex for many years now! It has never failed me ever since! I'm always trying out new detergents, this one looks great! I'm going to do my research and try this out soon. Great giveaway! I've never tried this brand, but it sounds awesome! I am always looking for new cleaning products to try! Thanks for sharing! That's very nice giveaways especially to all moms like me that we really need this cleaning products. I love Purex and this product is so awesome. Thanks so much for sharing this great giveaway. Purex is one of those that we buy a lot. We have never tried the powershot though. I will have to see what my wife thinks about giving it a try. I love the Purex aromatherapy crystals the best. This post reminds me that I have to go do laundry. ;) I like Purex. That definitely looks like it would come in handy. We switched over to Purex awhile ago for the price, can't beat it. Such an awesome giveaway! We haven't tried Purex yet but heard a lot about it. I'll check it out this weekend. I have used Purex for years. It's one of few soaps that don't break out my skin. It also my favorite because its one of the cheaper ones. I haven't tried using a liquid detergent. What I use here are powder detergents. I wish I could join this great giveaway. This is a product i need to try. My kids get stains on everything. I will have to look for some the next trip i make to the store. I like Purex Natural elements detergent. I grew up on Purex. Always did the trick and then some when it came to laundry. Oddly though I haven't used it since I got married as it's not the husband's preference. My favorite is the liquid detergent in the mountain breeze scent. I love the purex brand, i can't wait to test out my products. This is awesome and I love using Purex. It is cheaper and works amazing. I can't wait to try this new Purex Powershot. Thanks for sharing. I Like The Purex Crystals! I bet this would be a great laundry soap. I will have to give it a try sometime. What an innovative product! I love using Purex detergent because its much cheaper and works really well! I have not tried purex in years. This looks interesting and I might have to check this out. I love purex free and clear. i love the purex crystals. I love the blue & purple bottle of Purex Crystals.